Aesthetics – The KA-BAR Dog's Head or the Canal Street Squeeze? In our latest in depth head to head review – I will be comparing the large KA-BAR Dog's Head Coppersmith Lockback folding knife to the Canal Street Cutlery Squeeze Lockback folding knife. The large KA-BAR Dog's Head Coppersmith Lockback folding knife measures 4 7/8″ closed and weighs 4 ounces. Also, it features a Flat Ground, 3 5/8″, Clip Point blade made from D2 semi-stainless steel with a Rockwell Hardness of 56-58, a non-serrated edge, a mirror polished finish, and a classic nail nick. In addition, it features root beer brown jigged bone handle scales with a copper, dog's head, inlay and copper bolsters, stainless steel liners, and a Lockback locking mechanism. 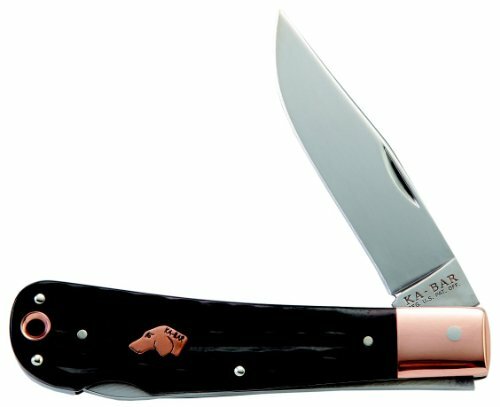 Last, large KA-BAR Dog's Head Coppersmith Lockback folding knife retails for $189.12. The Canal Street Cutlery Squeeze Lockback on the other hand measures 5″ closed, weighs 4.5 ounces, and features a flat ground, 3 3/4″, Clip Point blade made from D2 semi-stainless steel with a Rockwell Hardness of 58-60. Also, it features a non-serrated edge, a mirror polished finish, and a classic nail nick. In addition, it features antique ivory smooth bone or, reclaimed American chestnut handle scales with a brass, Canal Street, inlay, nickel silver bolsters, stainless steel liners, and a Lockback locking mechanism. Last, the Canal Street Cutlery Squeeze Lockback retails for $185.00. In my opinion, both of these knives are absolutely gorgeous! In fact, I especially like the fact that they both feature a long, slim, Clip Point blade design which is my favorite blade design. Considering all the possible variations on this blade design that I have seen over the years, I find that each blade on these two knives is particularly well shaped! In fact, when I minutely examine the shape of each blade, I can find no discernible difference other than the fact that the blade of the KA-BAR Dog's Head Coppersmith is 1/8″ shorter than that on the Canal Street Cutlery Squeeze which I cannot tell simply by looking at them. Also, I really like the root beer brown, jigged bone, handle scales on the KA-BAR since they are an excellent complement to the gorgeous copper bolsters. However, I also really like both the antique ivory, smooth bone, handle scales as well as the reclaimed, American Chestnut, handle scales on the Canal Street Cutlery Squeeze. In fact, unlike any other knife I have reviewed so far on this web site, I can't find anything I don't like about either one of them! But, in all fairness, I do have to say that I like the shape of the handle on the KA-BAR a little better than I do the Canal Street Squeeze and thus I am going to rate the KA-BAR Coppersmith slightly higher than the Canal Street Squeeze in this category. What more can I say about the blade design that I have not already said? Personally, I feel like the blade on each of these knives is very near to achieving absolute perfection! Thus, if I could redesign either or both blades, the tweaks that I would make would be so slight that the average person would never even notice them. Concerning the blade steels, both KA-BAR and Canal Street Cutlery have chosen to use D2 which is either an American made or a German made semi-stainless steel that is an outstanding high-carbon, high chrome, tool steel containing 1.5% Carbon, 12% Chromium, 1% Molybdenum, and 1% Vanadium. It is often used for the steel cutting dies in every tool and die shop in the U.S. because it can be hardened far beyond the favored 60-61 Rc. Also, although the first custom blade-smith to use this steel was Jimmy Lile, the strongest convert has been Bob Dozier who has made this steel popular by mastering the heat treating process. Consequently, because this air hardening steel contains the four key elements of Carbon, Chromium, Molybdenum, and Vanadium with no other alloying elements, it is part of a new category of blade steels commonly known as “super steels” and it will take a extremely fine edge and hold it exceptionally well. In addition, what makes this particular steel such a fine blade steel is its exceptionally high Carbon content which increases hardness, edge retention, abrasion resistance, and tensile strength. However, because it only contains 11.5% Chromium instead of the 12% required to be classified as a stainless steel, it is commonly referred to as a semi-stainless steel. Also, it has a relatively high Molybdenum content which increases hardness, harden ability, toughness, abrasion resistance, and tensile strength. Last, it also has a relatively high Vanadium content which not only refines the grain structure of the steel so that it will take and hold a significantly finer edge than steels that do not contain Vanadium, it also increases hardness, tensile strength, and impact resistance. So, for folding knife blades that will be used for hunting, D2 is a particularly fine steel. However, I would not necessarily recommend it for every-day-carry knives because of the extremely high Carbon content and the exceptionally high Rockwell Hardness because it is far more difficult to sharpen than blade steels such as 8Cr13MoV or 420HC. Jigged bone has always been one of my favorite handle materials for fine quality folding knives and I especially like the root beer brown jigged bone handle scales on the KA-BAR Copper Smith since they are an excellent complement to the copper bolsters which I have never seen on any other folding knife. However, am also especially enamored with nickel silver bolsters as well as the antique ivory, smooth bone, handle scales and the reclaimed American Chestnut handle scales featured on the Canal Street Cutlery Squeeze. In fact, as you may or may not be aware, American Chestnut is extremely rare these days due to the fact that the very large majority of these trees were killed by a blight imported from China in 1900. Thus, the handle scales on the Canal Street Cutlery Squeeze are made from wood reclaimed from the Hoover barn located just outside of Hopkinsville, NY. which was built around 1920 with Chestnut lumber from the region. They used this timber because chestnut lumber was plentiful back then due to the fact that American Chestnut trees were the most dominate species in the Appalachian forest at that time. Concerning locking mechanisms, both of these knives feature a traditional lock back locking mechanism which incorporates a large, heavy duty, leaf spring sandwiched between the stainless steel liners with either a much smaller leaf spring or a coil spring on the lever end to apply positive pressure to the large leaf spring who’s opposite end rests tightly against the edge of the blade's tang so that, when the blade is rotated into the open position, the hook milled into the leaf springs falls into a corresponding groove milled into the edge of the blade's tang and thus locks it in place. However, although this type of locking mechanism is very popular on large folding knives, it should be noted that it requires two hands to release the lock and thus close the blade. Due to aggressive pricing and discounting on Amazon, you should click through and see the latest ‘live’ price on the store for both the Ka-Bar Dog's Head and the Canal Street Knives Lockback. At the time of writing this, both knives were almost discounted by 40%. When it comes to weighing the value of these two knives, I find that they are so close to each other in blade materials, handle materials, and retail price that there is essentially no difference between the value of each knife for the money. Thus, I am inclined to rate each knife equally in this category. Concerning my personal preference, I like both of these knives so well that I find it very difficult to differentiate between them. However, if I were forced to choose one knife over the other, my gut tells me to choose the KA-BAR Dog's Head Coppersmith over the Canal Street Cutlery Squeeze. However, please note that this is my gut instinct and not a decision of my rational mind because, from reading the history and description of each company as well as my knowledge of KA-BAR's usual focus, my rational mind tells me that more care has gone into making the Canal Street Cutlery Squeeze. Last, in adding up the numbers, I see that these two knives are so close to each other in total scores on the Folding Knife HQ rating system, with ethe KA-BAR Dog's Head just pipping the CSCC Squeeze across the line. That said, I would not hesitate to recommend either knife to my readers since they are both absolutely gorgeous, extremely high quality, knives that display not only a fine choice of materials, they also display the highest level of the blade-smith's art.